Asha Paswan is the daughter of Ram Vilas Paswan from his first wife Raj Kumari Devi. 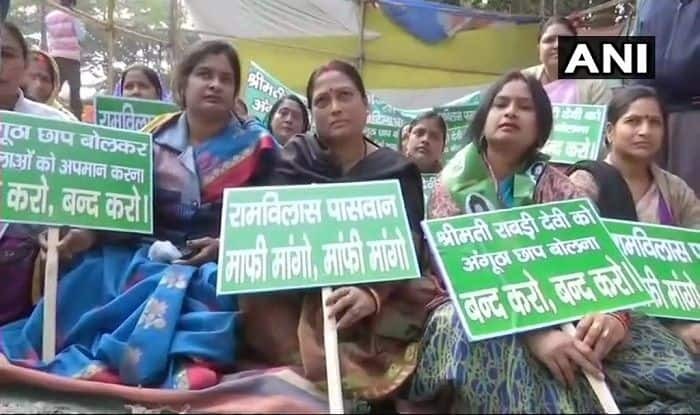 New Delhi: Lok Janshakti Party (LJP) president Ram Vilas Paswan’s estranged daughter Asha Paswan on Sunday staged a protest for calling former Bihar Chief Minister Rabri Devi an ‘angootha chhap’ (illiterate). Holding placards demoing apology, Asha Paswan along with dozens of women staged the ‘dharna’ in front of the Lok Janshakti Party office near the Patna airport. She wants Ram Vilas Paswan to apologize to Rabri Devi. “My father should take back his words,” she said. On Saturday, Asha had slammed her father for making a veiled attack on Rabri Devi and demanded an apology from him. She had threatened to stage a dharna at the LJP’s office. “Papa has insulted Rabri Devi. My mother too was uneducated — a reason why he abandoned her. He must apologise or else I will stage a dharna in front of the LJP office,” Asha had said. Paswan, whose party will contest the upcoming general election along with JD(U) and BJP in Bihar, had at a press conference on Friday attacked the opposition RJD for opposing the NDA-led government’s bill to provide 10 per cent reservation for the economically backward in general category. The remark was seen as a reference to the events of 1997 when RJD chief Lalu Prasad had to step down as Bihar chief minister as he faced arrest in the fodder scam cases and his wife, Rabri Devi, who has little formal education, was appointed as his successor. Asha Paswan is daughter of Ram Vilas Paswan from his first wife Raj Kumari Devi. Asha Paswan’s husband Anil Sadhu is an RJD leader and consider close to RJD leader Tejashwi Yadav, Lalu Prasad’s son.